The Druk Path Trek, one of the most scenic and popular treks in Bhutan, is a relatively a short trek, it takes us to an elevation of 4210m above sea level, making it moderately strenuous. You can see many remote lakes, beautiful views of high mountains and variety of rhododendron. It is done either from Paro to Thimphu or Thimphu to Paro. The ideal time would be in spring when you can see many varieties of flowers. The Druk Path Trek is one of the most frequented treks and is a fairly short yet exhilarating trek that is both challenging and rewarding. The views, like most other treks in Bhutan, are fascinating and exhilarate ones senses, owing to the incredible beauty and majesty of the Himalayas. The Druk Path Trek commences from Paro to Jele Dzong at 2591 meters, from where one can see the Paro Valley with snow-capped mountains behind. The trail to Jangchulakha at 2896 meters takes you through thick alpine forests and rhododendron trees. The views of the Himalayas can be seen in late autumn and winter. The Druk Path Trek usually covers the short five day, which leads from Paro to Thimphu or vice versa, crossing the chain of mountains that separates the two valleys. Although the route is sparsely inhabited, there are wonderful lakes teeming with fish and the area is famous for its spectacular rhododendron forests, which bloom in May. In the clear weather of late autumn and winter there are great views of the Himalayas. The Druk Path (trek) goes as high as 13,000 ft past fresh water lakes abundant with fish (trout). The flight into Paro by national carrier, Druk Air, is a befitting introduction to the spectacular beauty of Bhutan . In clear weather, magnificent views of the world’s highest peaks, give way to the lush green Paro valley as you land. Then you will be transferred to hotel. After tea at hotel, we visit Ta Dzong (built in1656 and renovated in 1968), an ancient watchtower, which now houses the National Museum . Below the museum is the Paro Rimpung Dzong (literally meaning “Heap of Jewels”, built in 1646 by Shabdrung Ngawang Namgyal, the centre of civil and religious authority in this valley. we drive in the evening to the ruins of the Drukgyal Dzong 16 km up the valley. Built in 1647 by the great Shabdrung Ngawang Namgyal, father and unifier of medieval Bhutan , the Dzong was destroyed by accidental fire and left in ruins as an evocative reminder of the great victories. it was built to commemorate. Explore the ramparts and on a clear day experience is an unforgettable view of Mt. Jhomolhari (7,314 m). On the way back, visit Kichu Lhakhang, built in 659 A.D by the Tibetan king Srongsen Gampo. Dinner and over night stay in Hotel. Today is a short trek. The trek begins above the National Museum ; we climb till we reach camp. If the weather is clear, the Paro valley and the snow-capped mountains can be seen. The campsite is near the old Jele Dzong. 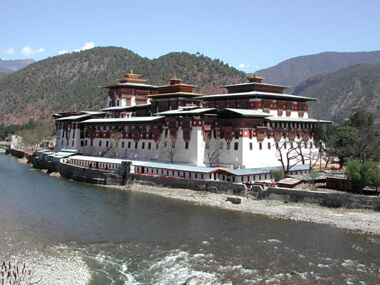 If the caretaker is there, you can visit the Dzong. Altitude 3,350m; Distance 10 Km; Time 3 - 4 hours. The trek starts with a short climb and then passes through a thick alpine forest of rhododendron and gradually climbs till we reach camp. You may see yak herders around your campsite. Altitude 3,700m; Distance 12 Km; Time 4 - 5 hours. The trail follows the ridge and on a clear day, the views of the mountains and valleys are beautiful. Our camp is close to Lake Jimilangtso . These lakes are known for their giant sized trout, and if lucky, you may enjoy well-prepared trout for dinner. Altitude 3,800m; Distance 16 Km; Time 6/7 hours. The trail takes you through dwarf rhododendron trees past the lake of Janetso . Overnight stay at camp. From here we slowly descend down to Phajoding Monastery from where Thimphu town is visible at the valley floor. Overnight stay at camp. It is the short trek to Thimphu valley through dense forest. We take Lunch at Thimphu . After lunch, we drive to Paro. Dinner and Overnight stay in Hotel at Paro. Early morning, we drive to the airport and farewell.